ON SALE NOW---Save over 15%--Sale Price: $47.95, Reg Price: $58Excellent value!!! Veterinarian-approved, comprehensive formula for pets with cancer. 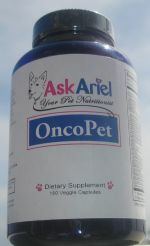 Great choice if you are looking for an all-in-one, cancer supplement for your pet. We have had terrific results with this product. Pet owners report increased energy, stamina and longevity. Use for cats and dogs. This is a broad spectrum formula that contains vitamins, minerals, antioxidants and nutrients that have been shown to enhance the immune system and provide critical support for pets with cancer. Great opportunity to use an all-in-one product rather than having to buy 5-6 separate products. OncoPet cancer support formula has been used extensively with cancer patients undergoing chemotherapy and radiation treatments. Gentle--no reported side effects. OncoPet is formulated from leading research on natural agents such as: D-Limonene, IP6, Tocotrienols, Modified Citrus Pectin, Calcium D-glucarate and Arabinongalactans. The formula includes agents that have been shown to help limit or discourage abnormal cell growth and/or have chemoprotective and anti-inflammatory actions. OncoPet will help your pet's immune system and provides important nutrients to help fight cancer. Pet owners report that their pets tolerated chemotherapy better upon using the product because of the detoxifying herbs included in OncoPet. Click here to learn more about using holistic care to treat dogs and cats with cancer.Save money and purchase OncoPet with Immune Harmony--our premium, cancer support package.